Introducing the Micro Recon 1's. With a 2 inch blade they share most of the features of their larger counterparts. The only differences are the handle slabs are made of Griv-Ex style G-10, and the pocket clip has been replaced with a small key ring. 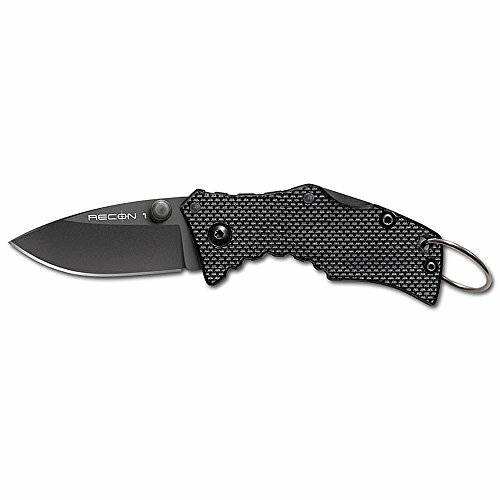 Cold Steel is famous for raising the bar in the knife industry and our Recon 1 tactical folders are setting a standard that's hard to beat. Why? Because they are as tough as nails and will cut like a chain saw! With a 2 inch blade, they share most of the features of their larger counterparts. The only differences are the handle slabs are made of G-10 Griv-Ex Style, and the pocket clip has been replaced with a small key ring. Every facet of their construction has been over engineered to make them as strong, durable and effective as humanly possible. The blades are made out of imported Japanese AUS 8A stainless steel that's been vacuum heat treated and sub-zero quenched and the handles feature G-10 laminate scales artfully contoured and scalloped for a terrific non slip grip. Plus, they are held together by the latest in high strength mechanical fasteners and further anchored by a 6061 heat-treated spacer. To complement their super tough blades and handles they're equipped with our revolutionary Tri-Ad lock , which practically precludes lock failure.